Consider all of the options and their consequences before making any decisions. Only take advice from those who are qualified to give it (most financial advisors aren’t). That way you will know all of the options that are available before making one of the biggest decisions of your life. Through our fully qualified Care Fees advisers, we aim to ensure you can afford your preferred choice of care for the rest of your life. We offer an initial consultation without obligation, and cost of the fully comprehensive Care Fees Report is also covered by ourselves. Brownlow Wealth Management Ltd provide advice in establishing, growing, managing and preserving wealth. We specialise in advising on the complex area of care fees planning. We help individuals that need care together with their families, understand the implications of care requirements with an emphasis on straightforward solutions to the costs of paying for care. 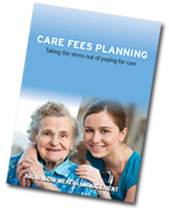 You can download a pdf version of the Care Fees Planning Brochure by clicking on the download link below. As Care Fees Planning specialists who are accredited by The Society of Later Life Advisers* (SOLLA) we can show you whether it is possible to secure care at the first choice of home for the rest of the individual's life. This can give all the family peace of mind that care fees are being met indefinitely, that they will not run out of money and fall into the hands of the Local Authority. * The Society of Later Life Advisers (SOLLA) aims to assist consumers and their families in finding trusted accredited financial advisers who understand financial needs in later life.